The Dräger X-am 7000 can be equipped with 2 catalytic Ex, Infrared or PID DrägerSensors and up to 3 Electrochemical DrägerSensors maximum. An integral sample pump and datalogging are optionally available. The unit is delivered with carrying strap, calibration adaptor and rubber boot. 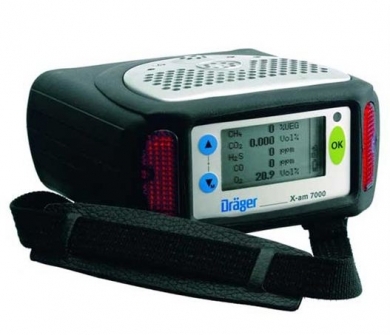 Draeger X-am 7000 kits include the X-am 7000 with specified sensors and rechargeable battery option plus charger, and specifed options for pumped or diffusion sampling plus datalogging as noted.